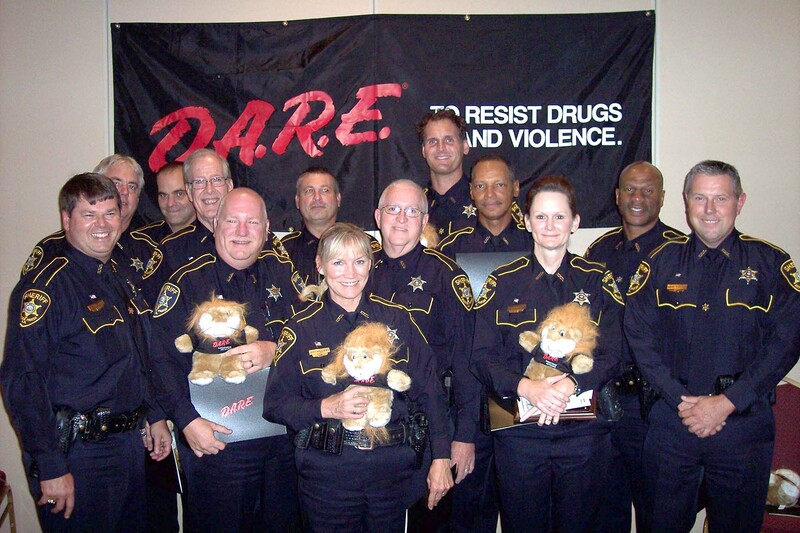 Thirteen Bossier Sheriff’s Deputies attended a two-week school in Pineville that certified each deputy as D.A.R.E. (Drug Abuse Resistance Education) officers. The class began Aug. 12 and concluded with a graduation ceremony on Aug. 23. The intense two-week training included such topics as drug information, decision making and classroom management. At the conclusion of the training, each deputy received a certificate of completion. Deputies Ricky Speir, Kathy Naron and Jeremy Johnston received Most Outstanding Team Member awards for their leadership role on their teams. Since being implemented in 1990, thousands of 5th grade elementary students have graduated from the D.A.R.E. program. Beginning this school year in partnership with the Bossier Parish School Board, the D.A.R.E. curriculum will now be taught to 8th graders in every middle school. Sheriff Julian Whittington, one of the first D.A.R.E. officers in Bossier Parish, has seen first hand the success of the program. Sheriff Whittington believes the principles that are taught in the program are vital in making students successful, productive and drug-free citizens. Expanding the program to the middle schools gives deputies another opportunity to invest in these students’ lives before they move on to high school and help coach them to make responsible decisions for their future. D.A.R.E. helps young people build self esteem, teaches them how to deal with unwanted peer pressure and encourages them to find healthy and productive alternatives to violence, gangs, drugs and alcohol. D.A.R.E. also raises awareness of bullying and teaches students how to report bullying when they see it. Also taught to these students are communication techniques and responsible decision making. Those who graduated D.A.R.E. Officer Training are: Greg Barnard, Greg Ebarb, Michael Freeman, Kenneth Gay, Jeremy Johnston, Carl Jones, Kathy Naron, Greg Kimbrough, Steve Porter, Rickey Speir, Lane Tuggle, Lex Webb and Judy Williams. These newly trained D.A.R.E. officers, some of which are already assigned as School Resource Officers in the middle schools, will be teaching the D.A.R.E. curriculum this semester.